BugBlog: Anthophora plumipes is back! Yesterday it was the equinox, so it is finally spring. We had a sunny mild day today and from first thing in the morning we've had a couple of Anthophora plumipes males patrolling in the garden. I saw the first male of the year on the 17th of March, but it was too fleeting a sight and he did not stop. 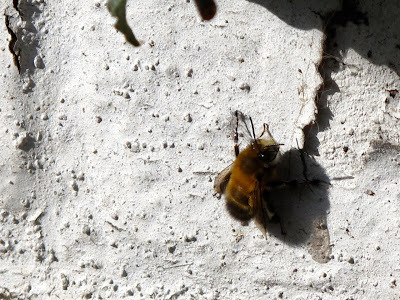 Today I managed a few shots during the few seconds one of the males Anthophora stopped to rest on a wall. You can see their forward-pointing middle legs, with the plumes of hairs that give them their name. These bees - as honey bees and bumblebees - are extremely endothermic, that is, they are able to increase their body temperature with respect to their environment and this allows them high activity levels at temperatures where other insects just sunbathe to increase their body temperature. Experiments by Graham Stone and colleagues have studied the ability of A. plumipes to increase their internal temperature. Accordingly, at the 8 degrees in which bees were active this morning, their body temperature is likely to have been around 28oC. The males patrolled constantly in a route around the garden and occasionally stopped to feed in some small Daffodils and Primroses. Males always emerge first from the nest where they were born, followed by the females. This is so because in the long tunnels where females nest, they lay fertilised eggs first (which will become females) and the last ones unfertilised (which will become males) and the bees emerge in reverse order of laying as the last eggs laid are closer to the opening. I am finding your posts very informative and they are helping me with my (poor) insect identification enormously. Keep 'em coming, please!